Nao Tsuda is a field “person.” In Japanese, the characters for “person” and “thing” are both pronounced the same, “mono,” but this is no coincidence, for underlying both is an animistic view of nature, a view reflected in the use of the character for "thing" in such terms as monogatari (“tale”) and mono no ke (“supernatural being”). In other words, to say that Nao Tsuda is a field “person” means that he is in touch with “things.” Field “people,” or in other words fieldworkers, must be extremely well versed in ways of handling things in themselves. The first, “NOAH,” was shot in the Canton of Valais in the Swiss Alps. In this region, which contains a number of mountain ranges above 4000 meters, meltwater from glaciers has been used by people and in pasturage and agriculture for thousands of years. In order to effectively utilize this life-giving water that trickles down like fine threads, technology was devised to make it flow artificially in waterways. Tsuda met mountain men whose job it is to maintain these mountainside waterways, or bisses as they are referred to in French-speaking Valais, and walked with them. 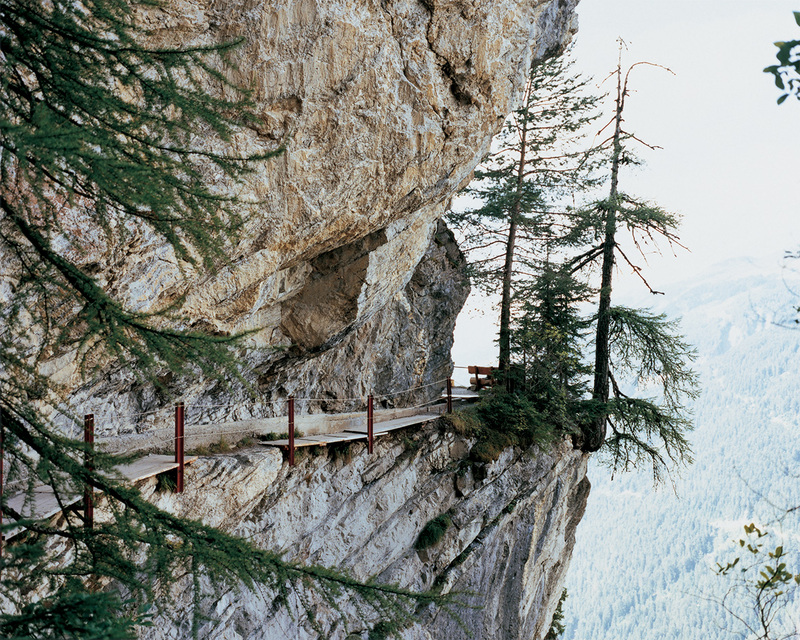 A wrong step would send them plummeting to the valley floor. Beside the waterways, they buried small crosses, like amulets in memory of their colleagues who had lost their lives, or as sacrifices to ensure the safety of those still living. Here, Christianity has been woven into the fabric of nature, with most of its artificiality being fused with what can only be described as mysticism or animism. The drops of the water that flow along the waterways are almost like incantations. The eyes of the mountain men shine quietly. In The Bible, it is written that when the floodwaters receded and Noah left the Ark after the reappearance of land, he first made a small altar. The appearance of a tiny brilliant corner. Such places of prayer manifest themselves on the earth. Tsuda realizes that the mountain men's eyes are eyes that can find these manifestations. 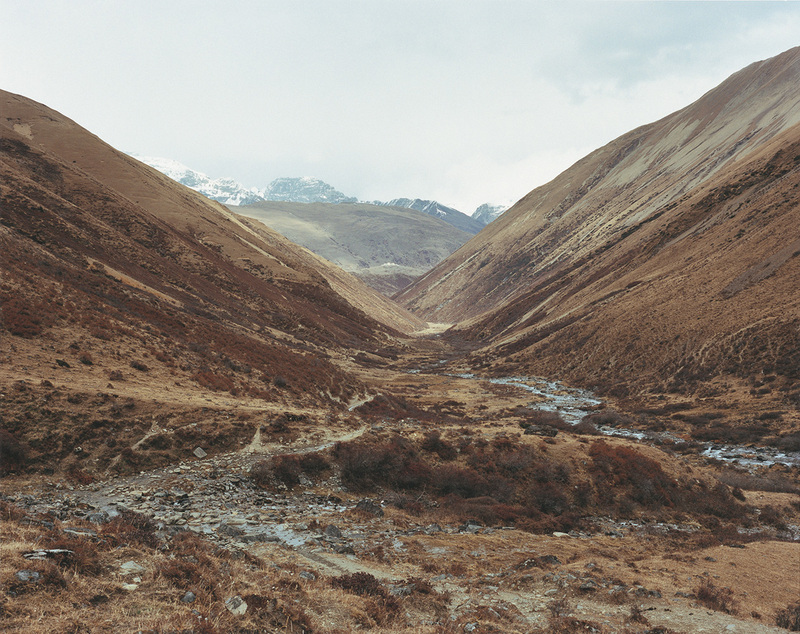 The second series, “REBORN,” is one Tsuda has been shooting on an ongoing basis in the Buddhist kingdom of Bhutan. 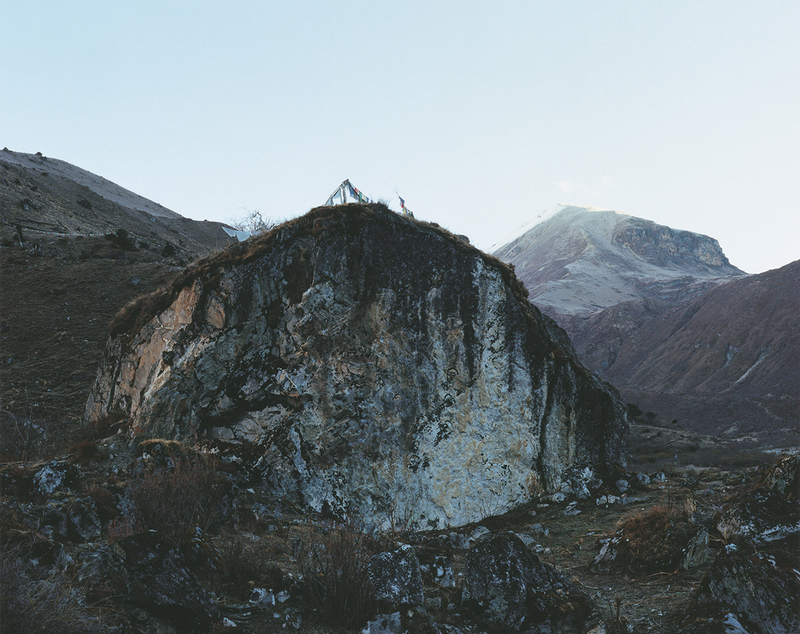 Tsuda sets off along a trail from the base of Mount Jomolhari, a sacred mountain in the Himalayas. Along this pilgrimage route that has existed since ancient times he encounters people on the move. These nomads travel back and forth with their livestock between the mountains and the villages depending on the appearance of vegetation. For the people who live here, the world is nothing more than the place in which they live. However, although the mountains appear desolate, they are in fact a source of life, and these nomads have lived for centuries by gratefully relying on them for food and provisions. Along the route stand phallic po, symbols of vitality that serve as talismans, while horizontal prayer flags known as lung ta flutter in the wind. Here, too, the artificiality of esoteric Buddhism has been dissolved into nature. Compared to the earth, humans are of no greater importance than grains of sand or weeds, and yet for this reason they are rare. They are painfully made aware that far from conquering nature, humans are nothing more than prey that are constantly stalked and hunted. Consequently, one can only conclude that the likes of prayer and religion evolved out of this kind of topography. 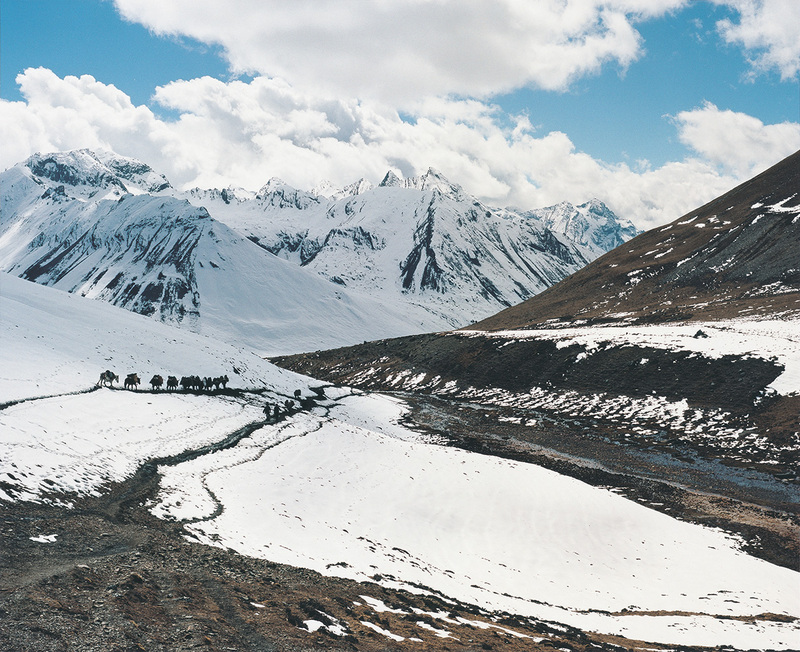 In winter the mountains become deserted. Tsuda arrives just before the mountains close and watches. And takes photographs. At this "crucial moment," he watches and photographs what he sees there. He closes in on the mountain. How does this world appear to nomads on the move? This, too, is something that Tsuda closes in on. In deserted places in the mountains, to those who live there the stars in the sky seem closer than anything else. Looking at photographs of the night sky Tsuda took, this is something that is clear. 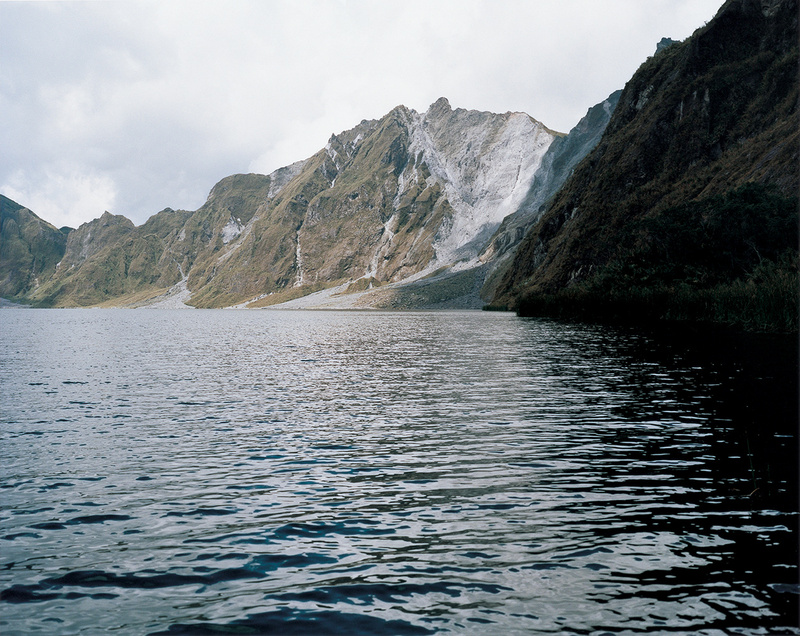 The third series of photographs are of the area around Mount Pinatubo on the island of Luzon in the Philippines. Mount Pinatubo experienced a major eruption in the early 1990s, billowing smoke and ash as far as the stratosphere to the extent that in the year in question sunsets around the world turned unusually red. Earth was thrown into the air and a crater lake was formed, a large quantity of ash accumulated on the ground, and lahars occurred, sweeping away people and houses and forests in rivers of mud. It was almost like the flood that Noah experienced. It looked like complete destruction, but at the same time it represented the appearance of a “new path.” The people living in the affected area (who settled at the foot of Mount Pinatubo more than 20,000 years ago and are referred to as "Negrito" due to their dark skin color) are forging new lives out of this scene of destruction. 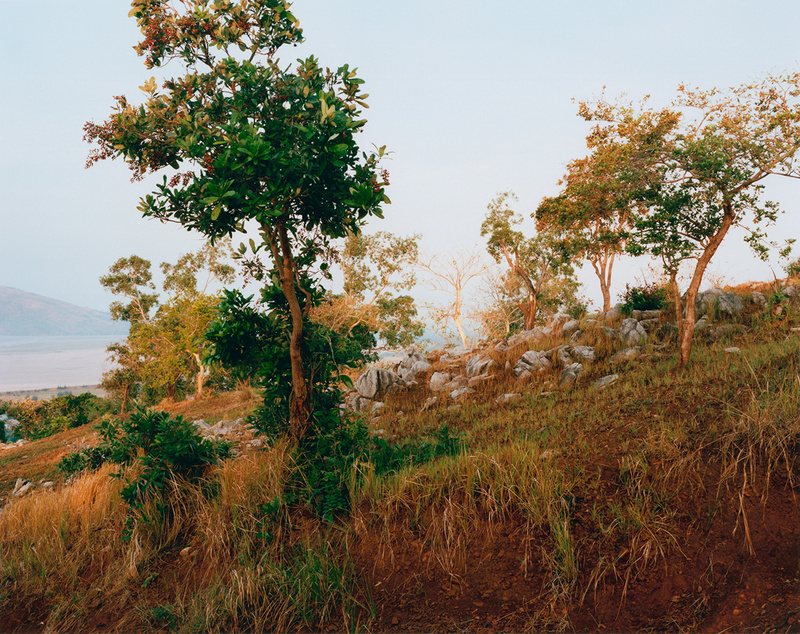 Amidst this, Tsuda spends time in an Aeta village. He works alongside the village headman, Roman King, and learns various things from him. The first plant to put its head above the ashes and produce fruit was a wild banana known as amukaw. Children use magnets to remove iron sand from the riverbeds, which they then sell. Here, everything produced by modern civilization is gone, washed away by the lahars. One day, Tsuda is led by Roman King to the top of a mountain from where he sees people approaching from the distance. They are people returning to live by Mount Pinatubo, drawn by their faith in the deity of the mountain, Apo Namalyari, a faith that remains strong even after the 1991 eruption. Gathering after walking for hours along rivers clogged with ash, they exchange belongings and acquire enough provisions to make a living. 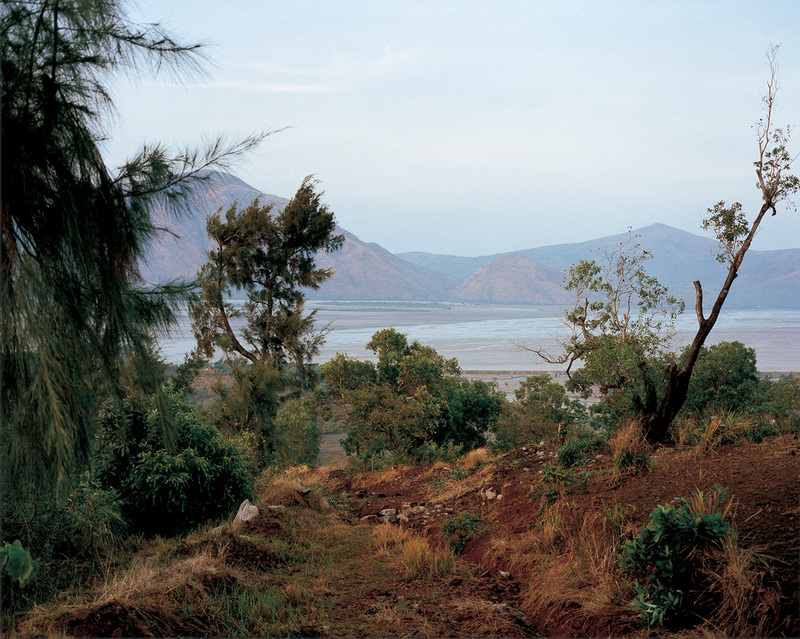 New customs that emerged in the wake of the destruction wreaked by the volcano, changes in the surrounding landscape. The small wild bananas play a central role in providing nourishment, both physically and spiritually. This much Tsuda knows. Tsuda closes in on the "eyes of the mountain." What he is trying to do seems impossible. Because it entails becoming the eyes of another. In this case, the other is both the people who live in "that place" and the mountain itself. People are not the only things with eyes; there are eyes in mountain rocks, in moss, in insects, and in flowers. Field people know this. Photography entails looking at the world anew. It entails turning the visible world into a photograph and looking at it. It does not entail, however, capturing the world as it is with one's own eyes. It entails knowing that if reality in fact exists, it lies not in the photograph but in the world behind it. And so as a matter of course, Tsuda's actions are the exact opposite of the conceit of modern photographers who seek to document the world. Because his work involves traveling to the ends of the earth and becoming the eyes of the mountain rocks and of the wild bananas and looking at the world. Throughout his career Nao Tsuda has sought to understand the art of closing in on "things" as a means of knowing the art of seeing. Or to put it another way, the art of animism. Looking at his photographs, I am convinced that Tsuda's training in this art has entered a new stage. As well, though I cannot express it accurately in words, I think perhaps they represent a new art of love, a new stage of affection for "things." When I think of this, it seems as if the spirit of the wild banana has infected even me. What is certain is that Nao Tsuda's photographs have set foot on a new, untrodden stage. I walk resolutely along a mountain road, well-trod by people and animals. In the way that the sun goes down, I stop walking when all the energy I had in store for that day is exhausted, fall asleep in that place, and wake to greet the morning. I have continued to spend time in the mountains since my visit to the Valais region of Switzerland last summer. In the Kingdom of Bhutan, to which I have been travelling in recent years in early autumn, I challenged myself to the Chomolhari trek. We set out on our journey loaded with several hundred kilos of equipment, food, tents and other things with an assistant, a guide, 2 cooks and 11 horses, and a young boy to care for the horses. Walking led thinking. No maps were unfurled to chart our course. Our position was found as we walked across a glacially eroded U-shaped valley by looking up towards the towering peaks of the Himalayas. This spring, I was off on another journey. Destination: the area surrounding the Pinatubo volcano on the island of Luzon in the Philippines. 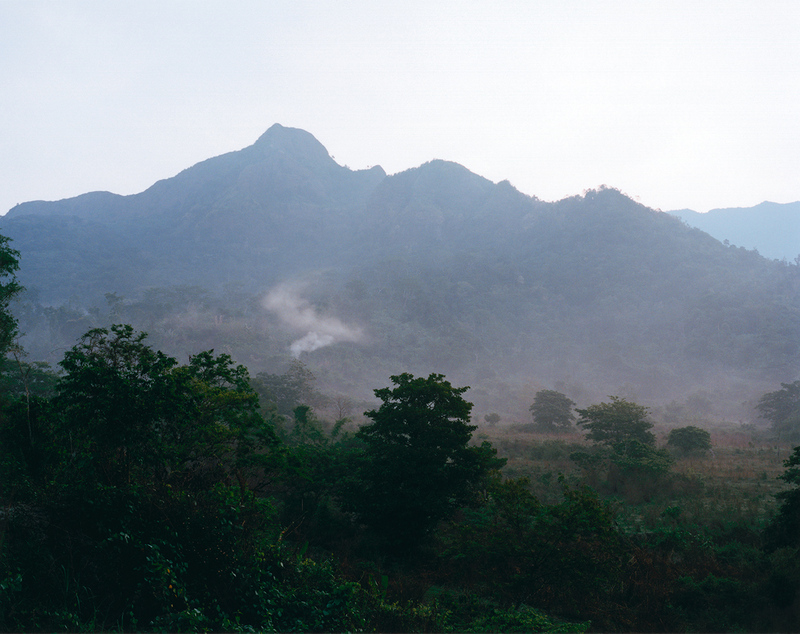 There was a massive eruption there in 1991, said to be one of the largest natural disasters of the 20th century. I was wondering whether everything had been lost. The road stretched before us through a grey-colored riverbed. Born in Kobe on 1976. 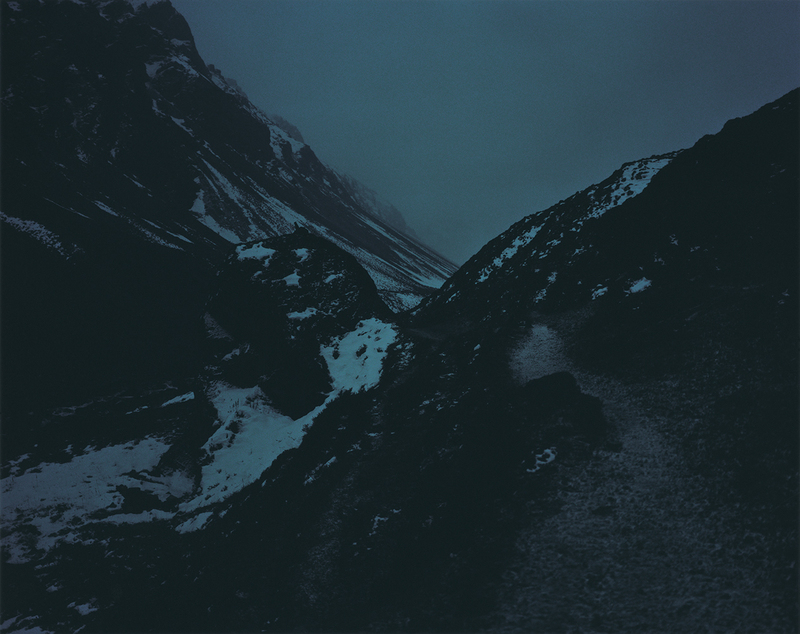 Tsuda is a photographer who has been showing view-finder, Tsuda interprets the “relation between humans and nature” passed down for generations since ancient times and unflinchingly captures the memory-going back to primeval times-that he believes is embedded in the landscape.The main series of works include, "Coming Closer"(2001-2004), "Kogi"(2005-2009), "SMOKE LINE"(2008), "Rera Faraway"(2009), "Storm Last Night" (2010), "REBORN" (2010-), and "Earth Rain House" (2012). With his unique view toward nature and his sincere approach to a timeless theme: the relationship between photography and time, Tsuda is spotlighted as a cutting-edge, who is cultivating a new trend of the landscape photography in 21st century. In 2010, Tsuda won the Minister of Educational Award for New Artist in Fine Arts. From 2013, Tsuda serves as the visiting associate professor of Osaka University of Arts, the visiting professor of Osaka University of Economics. His publications include “Kogi” (MONDE BOOKS), “SMOKE LINE” (AKAAKA), “Coming Closer” (AKAAKA + hiromiyoshii), “Storm Last Night” (AKAAKA), and “SAMELAND” (limArt), etc.